I will shortly have a Sharkwerks pipe available for a 997 Gen 2 Turbo. I have attached a picture to show it in place. 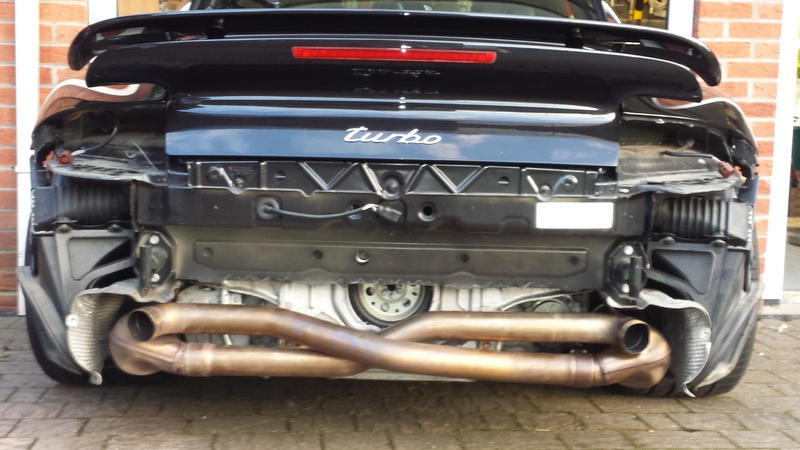 Made from T304 Stainless Steel and weighing 8 lb's less than a std exhaust. This really makes a massive difference to a gen 2 turbo, put it in Sport mode and you get an amazing sound from the car when you press on! I believe these are around £1370 from the U.S. Current price is $1595 plus carriage to the U.K. I want £775.00 delivered to your U.K. address by courier. Is this also known as 'X pipe' ? Where is this item coming from ? Yes as you can tell from the picture they are called an 'X' pipe, the std silencer is open so the two pipes meet in the box with this set up the two exhausts are kept entirely separate. They are made in U.S. by Sharkwerks so if you order one through their site it will be airfreighted over with all the additional charges. I'm not a 100% sure if there is anybody in this country importing them but I doubt there would be a huge demand to make it worth their while. For now I'm keeping my car so my item is no longer available. Just can't part with my car! By the way if anyone's wondering, they do not set off any warning lights on your dash or need a remap. They are fairly straight forward to fit as long as your CAT nuts are in good shape. You do need to slacken off the D/S CAT to fit the pipe in as it is a one piece unit. You don't get a 'drone' from them but you do get a bit of a rumble when you accelerate in a higher gear, they do change the whole sound effect of a Turbo and are about a quarter of the price of a Kline, not knocking the Kline but they are an expensive unit for more or less the same effect. Personally the two easiest and most effective upgrades on a Turbo are this and a DSC module and if you buy them S/H also the cheapest!